This what your System Admins Howto Blog Ad will look like to visitors! Of course you will want to use keywords and ad targeting to get the most out of your ad campaign! So purchase an ad space today before there all gone! This step-by-step tutorial shows you how to install Kubuntu 15.10 (Wily Werewolf) in VMware Workstation but you can also use VMware Player which is free. This tutorial also helps if you install Kubuntu 15.10 on physical hardware. If you are new to Kubuntu or you want to explore its new features, It is very safe to install Kubuntu 15.10 as a virtual machine inside VMware Workstation. Installing Kubuntu 15.10 Wily Werewolf as a VM is very similar to installing on physical hardware. VMware workstation and VMware Player are virtualization softwares at the desktop level. They allow to run multiple virtual machines on a physical machine. You can visit VMware product page for more information about the latest release for VMware Workstation and VMware Player. Kubuntu is a free, user-friendly Linux distribution. Kubuntu is an official derivative of the Ubuntu operating system which uses KDE Plasma Desktop instead of the Unity graphical environment. It uses the same underlying system with Ubuntu. Every package in Kubuntu shares the same repositories as Ubuntu. Kubuntu 15.10 was released on 22 October 2015. It comes with Linux kernel 4.2, which was released only a couple of weeks ago. Kubuntu 15.10 comes with KDE Plasma 5, the next generation of KDE’s desktop has been rewritten to make it smoother to use while retaining the familiar setup. It also comes with KDE Applications 15.08 containing all your favorite apps from KDE, including Dolphin. Kubuntu 15.10 introduces stateless persistent network interface names and it is supported by critical security fixes, bug fixes and select app updates for 9 months. Update: You can also watch How to Install Kubuntu 15.10 (Wily Werewolf) in VMware Workstation Step-by-Step video tutorial below or keep continue reading the article. 1. Go to Kubuntu official website and download Kubuntu 15.10 Wily Werewolf installation ISO media and save it to your computer. In this tutorial, I will use Kubuntu 15.10 32-bit edition. 3. You can go with Typical (recommended) at Welcome to the New Virtual Machine Wizard screen. 4. Choose I will install the operating system later. Do NOT choose the second option, you mat get an error during the installation. So, be careful at this step. 5. Choose Linux as a Guest Operating System and choose Ubuntu version. 6. Give a name and set location for your Kubuntu 15.10 virtual machine files. 7. Specify how much disk space you want to use for Ubuntu VM. I set it as 60 GB. I also select Store virtual disk as a single file option. This option gives more performance to kubuntu virtual machine. 9. Go to New CD/DVD and select Use ISO image file then browse to Kubuntu 15.10 installation ISO media. 10. Go to Network Adapter and select Bridged: Connected directly to the pysical network option. 11. Go to Display and un-check Accelerate 3D graphics then click Close. 12. Click Finish at Ready to Create Virtual Machine screen. 13. Click Power on this virtual machine at VMware Workstation screen. 14. Click Install Kubuntu at Kubuntu 15.10 welcome screen. 15. Click Continue at Preparing to install Kubuntu. 16. Select Guided – use entire disk option at Installation type. This option will use entire virtual disk for installation. 17. Click Continue to write the changes to the disks. 18. Choose your time zone and then click Continue. 19. Choose your keyboard layout and then click Continue. 20. Write your full name, pick a username, set your password and set hostname for Kubuntu 15.10 and then click Continue to begin the installation. 21. Kubuntu 15.10 (Wily Werewolf) installation process takes approximately 5-10 minutes. 22. After the installation is complete, click Restart Now. 23. At KDE Plasma login screen, type user name and password that you specified in step 20. Congratulations, you’ve just successfully installed Kubuntu 15.10 (Wily Werewolf) in VMware Workstation. After the installation, I recommend you to install VMware tools for better performance and usability. You can use drag-drop file and automatic screen resolution adjustment features, if you install open-vm-tools. VMware recommends open-vm-tools whenever possible. I hope this Kubuntu 15.10 installation tutorial is helpful for you. If you liked it or found useful, feel free to like or share it. Any questions or comments or suggestions are welcomed! The article How to Install Kubuntu 15.10 (Wily Werewolf) in VMware Workstation Step-by-Step Tutorial appeared first on System Admins Howto. The article How to Install Ubuntu 15.10 (Wily Werewolf) in VMware Workstation Step-by-Step Tutorial appeared first on System Admins Howto. The article How to Install Ubuntu 15.04 (Vivid Vervet) in VMware Workstation 12 with Easy Install appeared first on System Admins Howto. 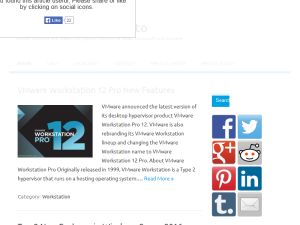 VMware announced the latest version of its desktop hypervisor product VMware Workstation Pro 12. VMware is also rebranding its VMware Workstation lineup and changing the VMware Workstation name to VMware Workstation 12 Pro. Originally released in 1999, VMware Workstation is a Type 2 hypervisor that runs on a hosting operating system. It runs on top of either Windows or Linux. Workstation 12 Pro still supports up to 16 virtual CPUs, 8 TB disk files, 64 GB of RAM and 2 GB of graphics memory. VMware Workstation Pro enables technical professionals to develop, test, demonstrate, and deploy software by running multiple x86-based Windows, Linux, and other operating systems simultaneously on the same PC. VMware Workstation 12 Pro takes virtualization to the next level with the broadest operating system support, rich user experience, a comprehensive feature set and high performance. VMware Workstation Pro is designed for professionals that rely on virtual machines. VMware Workstation Pro 12 also added support for DirectX 10 and OpenGL 3.3, the sets of APIs needed for handling today’s demanding graphical workloads, especially for 3D applications. Run multiple operating systems simultaneously on the same PC. Create powerful virtual machines to run the most demanding applications. Create restricted virtual machines that can expire. Run VMware Workstation Pro as a server to share virtual machines with others. Windows 10 Support: Run Windows 10 as a virtual machine. New Linux Operating Systems Support: Ubuntu 15.04, Fedora 22, CentOS 7.1, RHEL 7.1, Oracle Linux 7.1. Performance improvements for suspending and resuming encrypted virtual machines. Support for 4K monitors with high resolution. Support for multiple monitors with different DPI settings. Echo cancellation for voice and video calls with Microsoft Lync and Skype. Respect left-handed mouse setting on Windows host. Automatically suspend virtual machines upon host shutdown. NAT network configuration in Virtual Network Editor on Linux hosts. You can download the product for free from VMware official website. The article VMware Workstation 12 Pro New Features appeared first on System Admins Howto. Recently, Microsoft announced the general availability of Windows Server 2016 Technical Preview 3. There are number of improvements and new features in Windows Server 2016 but it comes with top 2 new features. These are Windows Server Containers and Nano Server. A highlighted new feature for this release is the Windows Server Containers. This is the first step in bringing containers to the Windows Server. Containers provide users with a way to run applications isolated from the rest of the operating environment. Windows Server Containers are part of the Docker open source project based on Linux technology. Docker and Microsoft are partnering to bring both Windows Server and Docker containers to Windows, and allowing developers to manage them with the standard Docker tools. These containers can be deployed and managed either using PowerShell or the Docker container-deployment client. Hyper-V containers are not yet built into this preview but it will be available in later preview builds. Eventually, Docker will be able to manage both Hyper-V Containers and Windows Server Containers. Windows Server 2016 TP3 also includes updates to the Nano Server deployment mode. There’s a new Emergency Management Console allowing users to view and fix their networking configurations directly from the Nano Server console. Nano Server offers an option of running Windows Server stripped down to its smallest footprint. Nano Server is approximately 1/20th the size of Windows Server Core. You can download Windows Server 2016 Technical Preview 3 ISO from Microsoft website. Microsoft advises that preview release should not be used in production environments. You can read all the new features come with Windows Server 2016 Technical Preview 3 at Microsoft TechNet website. The article Top 2 New Features in Windows Server 2016 Technical Preview 3 appeared first on System Admins Howto. VMware Tools is a suite of utilities that enhances the performance of the virtual machine’s guest operating system and improves management of the virtual machine. Installing VMware Tools in the guest operating system is vital. Although the guest operating system can run without VMware Tools, you lose important functionality and convenience. Why Should We Install VMware Tools in Kali Linux? It is very important that you install VMware Tools in the guest operating system. With the VMware Tools SVGA driver installed, VMware Workstation supports significantly faster graphics performance. The VMware Tools package provides support required for shared folders and for drag and drop operations. Update: You can also watch How to Install Official VMware Tools in Kali Linux 2 Sana Step-by-Step Video below or keep continue reading the article. 3. In the VM Menu of the VMware Workstation, Click Install VMware Tools. This mounts a virtual CD-ROM drive containing the VMware Tools installation files. 4. Click Open With Files on the pop-up menu inside Kali Linux. 5. You need to extract VMwareTools-9.x.tar.gz file. To do this, right click the file and then choose Extract To. 6. Choose destination. In this article I choose /tmp directory as shown below. 7. Now we are ready to install VMware-Tools binaries. To do this, open up your terminal again, if it is not already opened and then write the command below in order to install VMware Tools in Kali Linux 2 with the default parameters. 8. After Installation is done, you need to reboot your virtual machine. Installing VMware Tools in Kali Linux 2 done! After Kali Linux 2 virtual machine starts, you should be able to use drag and drop files feature and can resize or adjust vm screen. The article How to Install Official VMware Tools in Kali Linux 2 Sana appeared first on System Admins Howto. If you are the owner of System Admins Howto, or someone who enjoys this blog why not upgrade it to a Featured Listing or Permanent Listing?